Years ago, a friend gave me a pillow made out of men’s ties with embroidery along the rectangle seams. It wasn’t exactly a traditional crazy quilt pattern but it was a strong nod to the mismatched design, one of the hallmarks of this vintage 1800s craze. And a craze it was according to historians. On the one hand, it may have been a misplaced recycling trend since the quilters incorporated vestiges of clothing, fabrics and even lace into the odd-shaped fabric designs embellished with embroidery. On the other hand, it was also a new quilt concept since traditional quilts up until that time were very geometric, repeating pattern blocks in fabrics without any additional features such as embroidery. So it was with delight that I found this twin-size crazy quilt at a sale. The 68x88 inch size is close to a standard 64x86-inch standard twin size quilt, which is also an excellent size for a quilted wall hanging. One of my favorite features of crazy quilts are the embroidery designs. Having been taught embroidery from my very early years, I enjoy seeing the dexterity of the quilter and how they incorporate embroidery floss colors into the fabrics. That’s not an easy thing to do since some embroidery floss colors can easily get lost. Another way to see the artwork of the embroidery is to look at the back of the crazy quilt, which will feature the embroidery without the distraction of the fabrics. This vintage crazy quilt has another wonderful feature, a red heart close to the center with an embroidered horse inside. This detail makes me think this quilt was made for a young girl who had a very special four-legged friend. As you spend time looking at this crazy quilt, the fabrics also start to tell their story. How many of these fabrics were originally favorite clothing now repurposed into this crazy quilt. There are some soft cottons and rough solid textiles. 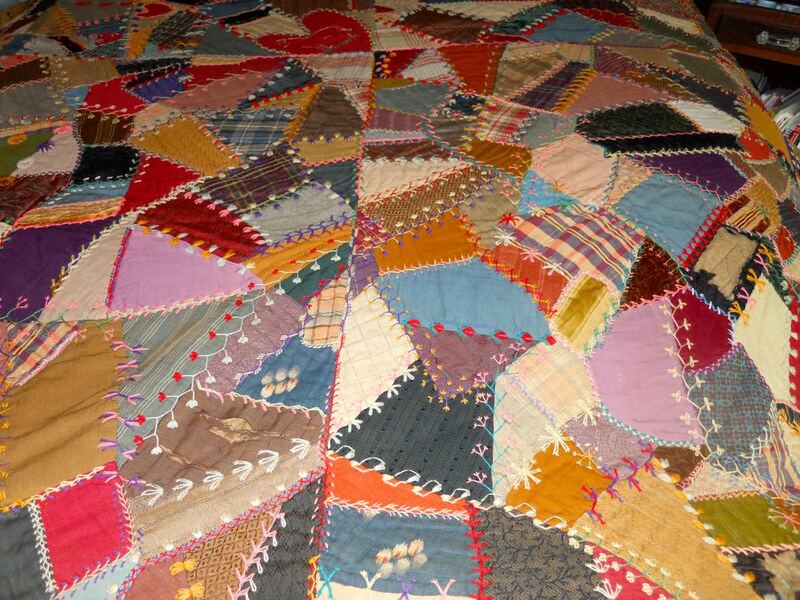 If this crazy quilt could talk! Crazy quilts are getting harder to find so this would be an excellent candidate to be used as a quilted wall hanging, installed somewhere away from damaging sun, smoke and cooking fumes.